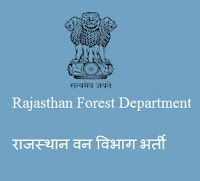 Rajasthan Forest Department (www.examforest.rajasthan.gov.in) issued Recruitment Advertisement No. F15(27)08/12594 dated: 27th August 2013 invites application for 194 Drivers, 49 Surveyor. Qualification: Class 8 Passed + Valid Driving License. Qualification: Secondary (Class 10) + ITI in Civil Survey/ Engineering. Pay Scale: Rs. 5200-20200 GP Rs. 2400. Deposition of Application Fee: 30th August to 19th September 2013.